Yellowstone National Park has a very diverse landscape. Its geological features includes volcanic thermal features; waterfalls; forests; canyons; rivers; lakes and mountains. The park is extremely large measuring almost 3,500 square miles and each section has its own feel to it. 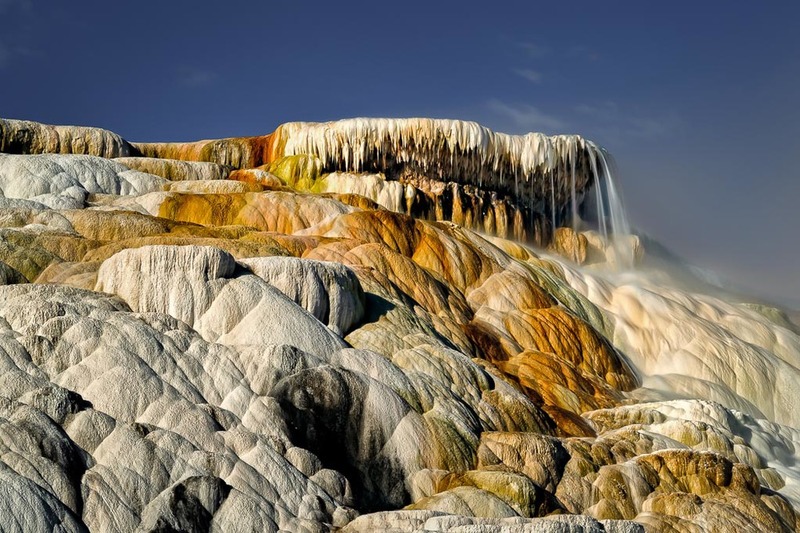 In the northwest corner lies Mammoth Hot Springs where the park's thermal hot springs are the most prolific. This amazing landscape was created over thousands of years as a result of hot water flowing from the Norris Geyser Basin and fed into a spring where the water cooled and deposited calcium carbonate forming the rock formations. As can be seen in this photo of Palette Spring, this process continues to form the landscape of the area.